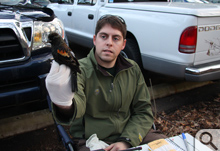 Nabbed a pair: Jacob Armiger '10 holds a pair of rusty blackbirds, male (left) and female fresh out of a mist net. The bright yellow eye is a distinguishing field mark on an otherwise nondescript bird. The rusty blackbird is a species only an ornithologist can love. Even when they’re in breeding plumage up in the boreal region of Alaska and Canada “rusties” are extremely nondescript-looking birds. Their undistinguished plumage takes on its eponymous rusty look when the birds are on their U.S. wintering grounds in the eastern half of the U.S. They keep pretty much to wet, woody areas, shuffling through sodden leaves, looking for the soft food they prefer. Even their call is unremarkable; it sounds like a couple seconds of a cassette tape on fast forward. For all its lack of traditional avian aesthetics, Euphagus carolinus is a creature of interest, even mystery, within professional ornithological circles. The continent’s population of once-common rusty blackbirds has declined by as much as 90 percent over the past few decades. Cristol is leading a faculty-student team of ornithologists who have put together a clue or two in the double mystery of the rusty blackbirds. It’s a double mystery in that while the birds seem to be in decline all across their range, a flock wintering each year on the campus of William & Mary seems to be doing just fine. Student-faculty research teams are common at William & Mary, but most often the professor initiates the project. The blackbird group grew around an undergraduate, Jacob Armiger ’10. Cristol gave Armiger some articles on various unsolved ornithological problems to help him decide on a topic. He came back and told Cristol that he wanted to take on the case of the missing rusty blackbirds. Any conversation with Cristol is punctuated by galvanic jerks of his head whenever a bird enters his field of vision, so of course he knew about the wintering rusties on campus. Cristol arranged for Armiger to spend a break apprenticing in the Midwest with the International Rusty Blackbird Technical Working Group to get some experience working with the birds, a species that offers challenges to even seasoned bird scientists. Armiger spent months following rusty blackbirds around campus, learning their daily habits. Even though the birds are seen around the sundial, he found that a much better bet was the low, wet wooded area downstream of Crim Dell, between Landrum Drive and the Lodges. After getting to know the birds, Armiger took Cristol to a spot in the campus wildflower preserve, pointed, and said “Put the nets right here.” Cristol was skeptical. The blackbird project began in earnest the following year when Andy McGann arrived at William & Mary to begin a master’s program in biology. McGann was interested in rusties as well, and began working with Cristol and Armiger. McGann and Armiger have separate, but overlapping, research projects. Armiger worked on the more general question of why the birds are on campus. McGann focused on the birds’ diet, drawing blood for analysis of stable isotopes that will reveal what the birds have been eating. Armiger and McGann settled into a winter routine of field work, trying to catch and process as many rusty blackbirds as possible before the flock migrates north around the second week of April. Ornithological fieldwork usually involves a considerable drive in a car, followed by several trips schlepping equipment from the car to where the birds are. This past winter, Armiger and McGann just had to make sure they had a good spot in the faculty lot at Landrum Drive and Ukrop Way, not a problem when you have to have the nets and the banding table set up by dawn. On promising days, they set up in the late afternoon as well as the morning. At first glance, their parking lot setup looks as if McGann and Armiger are tailgating before a football game or camped out to buy concert tickets. They sit in collapsible chairs near a card table that holds a tackle box of banding equipment, rather than a pre-game spread. They watch their mist nets with the attitude of relaxed expectancy of fishermen who expect a bite any second now. Mist-netting action is never fast and furious; when you’re after rusty blackbirds a good day means catching a few birds. Watching their nets one February afternoon, Armiger points out a lurking red-shouldered hawk. “She’ll scare off any blackbirds that might happen to be around,” he says with professional resignation. McGann reminisces about their biggest day of the year: they netted eight birds. There is some bycatch as well—wrens, robins, redwing blackbirds. They band the male redwings. When they see a bird in the net, they go into action, making their way down the usually slippery, often muddy slope of the gully. The first two years of blood samples are being analyzed for ratios of stable isotopes of carbon, nitrogen and sulfur that occur naturally in the food. Corn is a C4 plant, while oak trees are C3, McGann explained, referring to two different photosynthetic pathways, so the relative presence of these isotopes of carbon in a bird’s blood is a good indicator of what it has been eating. The ornithologists said there are several possible reasons for the predominantly male campus flock. Cristol said the females could be “getting hammered” on the nest by boreal forest predators or perhaps there’s a problem with the preferred diet of the females. McGann has his own ideas. The birds don’t bite hard because the rusty blackbird’s jaw muscles are weak, compared to other similar-sized birds, he explained. Cristol says the weak jaw muscles explain the rusties’ fondness for the smaller willow oak acorns, especially if they’re pre-cracked by student’s feet. The acorn-cracking foot traffic doesn’t fully explain why the wintering rusty blackbirds thrive on campus. For one thing, Cristol points out that the acorns are only available in mast years—years in which the oaks bear heavily—and they’re only available for a few weeks of the wintering period. “This highly disturbed, modified habitat” of our college campus offers no apparent advantages for wintering rusty blackbirds beyond a few weeks of crunched acorns, he said. And yet, the blackbirds come back. McGann said this year’s campus flock of around 200 was larger than most of those reported by birders throughout Virginia. Through the International Rusty Blackbird Technical Working Group, William & Mary’s blackbirders have been sharing their data with ten or so other groups across the U.S. and Canada. The three worked on what Cristol calls a “side project,” testing the birds for mercury. Cristol, McGann and Armiger are co-authors—with other blackbird researchers—on a paper to be published in an upcoming issue of the ornithological journal Condor. Though a few of the campus birds had high mercury levels, Cristol said the mercury was in the bird’s feathers, indicating that it had been ingested a while ago on their breeding grounds. The double-barreled rusty blackbird mystery is far from solved. Armiger will continue studying birds in grad school at Villanova. Cristol and McGann await results from the lab on the stable isotopes. Other undergrads have helped out with the rusties and one may take over Armiger’s study next winter. Still, some suspects have been eliminated. Mercury was a prime suspect, but the recent paper shows that contamination is unlikely to be a major element in the birds’ decline, but it could be one of a number of causative factors. Disease has been crossed off the list, as have blackbird-control programs run by the U.S. Department of Agriculture. Cristol said the decline of the rusties began decades ago, when government-sponsored exterminations of mixed blackbird roosts were going on, but those indiscriminate programs ended long ago and there are no mass killings of rusty blackbirds today. Elements of the storm could include predation by hawks, as Cristol notes that hawk numbers—particularly bird-hungry Cooper’s hawks—have increased dramatically over the years. (There’s even a pair nesting in a beech tree by the Sunken Garden.) The destruction of wetlands likely plays a part, as do mercury and other contaminants and competition with other bird species, he said.